One of most established Sedona art galleries, Lanning Gallery carries Fine Art: Contemporary Art, Modern Art, Classic Art, Abstract Art; fine art oil paintings, acrylic paintings, mixed media paintings; fine art stone sculpture, fine art bronze sculpture, found object sculpture, ceramic sculpture. Hand-cut, all-natural turquoise jewelry, sterling silver jewelry. Landscape paintings, figurative paintings, outdoor sculpture, animal sculpture and more. David Johns Navajo artist, David Johns Native American artist, David Johns Contemporary art, David Johns Contemporary paintings, David Johns oil paintings. "My creations on paper or canvas do not come from a place of preconception. They come from the innermost chambers of my soul." As a child David Johns viewed the world through the eyes of an artist. He sketched hogans, horses, sheep and landscapes – every part of life that surrounded him on the vast Navajo Reservation. As he grew older, Johns experimented with various mediums and subject matter. It was a high school art instructor who encouraged him to try portraiture, a genre in which he would professionally excel. By combining western education and art training with Indian philosophy and traditional Navajo teaching David Johns created a style of his own. He earned a BFA from Northern Arizona University's School of Fine Arts, and was awarded an honorary Doctorate Degree from the university in 1997. For over four decades David Johns painted the Native American portraits for which he is well known. But an interesting evolution was also underway: the backgrounds of these portraits were becoming increasingly abstracted and, roughly twenty-five years ago, these abstractions found that, within David Johns, the artist, they needed their own space. 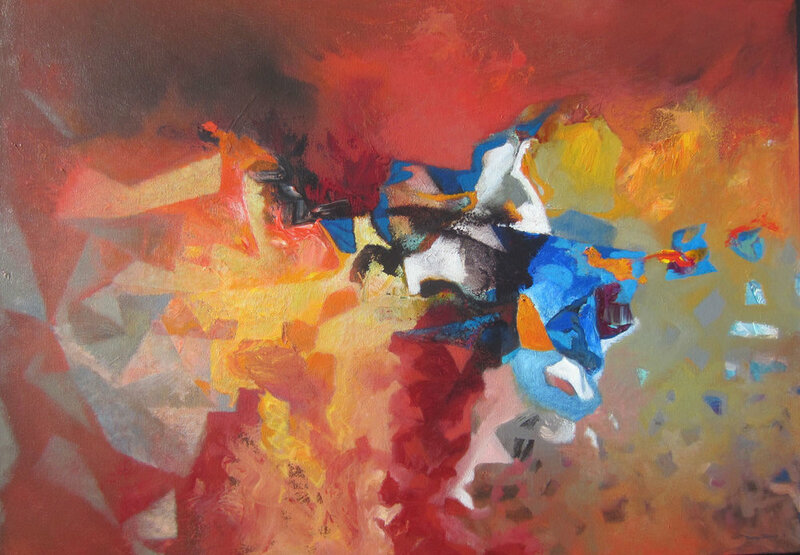 The resultant abstract paintings reveal even more the artist’s vision. "You don't see the songs or stories or prayers," David Johns explains, referring to the strong ties he holds for his native culture, "but you visualize what is happening." It is the essence of the experiences that make up the artist's past and present that David Johns seeks to capture on canvas; "it is the true kernel of what is visual," he states. In 1987 an all-Indian art exhibition in Helsinki, Finland successfully brought the works of David Johns to European art collectors. The late 1980s also brought a remarkable project to David Johns: the commission to paint a mural onto the 1600 square foot domed ceiling of the Concord Place in Phoenix, a project that, from research to sketches to execution (atop a 50-foot scaffold), would consume 2 years of his life. The result, an intricate portrayal of Native American history, is a breathtaking masterwork. In 1999 a one-man exhibition for David Johns opened on the French Riviera before it traveled to the United Nations in Geneva, Switzerland and to Grenoble, France. Works by David Johns continue to be collected both nationally and internationally. Copyright Lanning Gallery. All artwork featured at this web site is copyright of the respective artists.